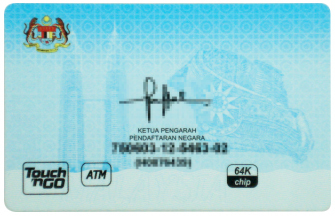 MyKad or GMPC (Government Multi Purpose Card) is a compulsory identity card of every Malaysian citizens. Introduced in 2001, it’s the first world smart identity card. The card is embedded with a microchip to contain basic information about the holder and his/her biometrics data. The first batches of MyKad contained a 32kb Electrically Erasable Programmable Read-Only Memory chip running on M-COS operating system. The government encourages the use of MyKad in other areas and the capacity was doubled in 2002 to become 64kb. The use of MyKad are encourages in four other areas including e-cash, ATM, Touch n Go and Digital Certificate on top of carrying the information of the holder, driving license details, passport details and health information. The microchip of MyKad is integrated with radio frequency technology, which FingerTec® terminals has been using for our card technology. Tests were carried out and MyKad can read MiFare technology on FingerTec® terminals. However, there is a limitation to MyKad usage in this area where cards issued prior to 2002 will not be compatible with our system. Only cards issued on 2002, have 64kb memory and contain Toucn ‘n Go logo can be used on FingerTec mifare terminals, as shown in the picture below. Absence of the Touch ‘n Go logo at the rear of the card means that the card is not equipped with radio frequency technology. Only FingerTec products that are using Mifare technology can read MyKad such as R2 MC, Kadex MC, TimeLine MC, i-Kiosk MC and etc. No extra cost: Use the readily available MyKad instead of buying the costly Mifare card. No exchange of cards: Nobody is going to trade his personal identification with someone else for any purposes at all. No loss cards: A person keeps or guards MyKad or personal identification better in comparison to other cards.